My children and I enjoy kits that teach new craft techniques, and include everything we need to get started like the #KlutzHandmade kits. Klutz has a beautiful selection of activity books for children over 8 years. These kits will keep children engaged and excited during March Break, as they make fabulous handmade items such as bracelets, clay crafts, and more. 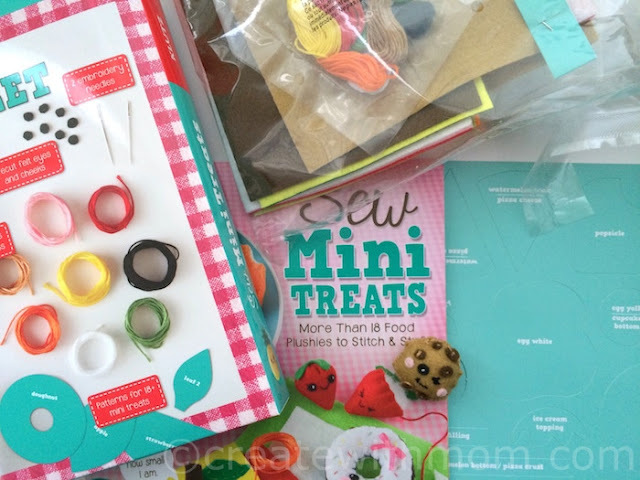 The Sew Mini Treats kit lets us make your own felted play food with faces. The kit includes instructions, patterns and materials to sew 18 cheerful, itty-bitty food items as well as tips and tricks to customize our own designs. This kit is a wonderful way to teach children to start learning the skill of sewing. 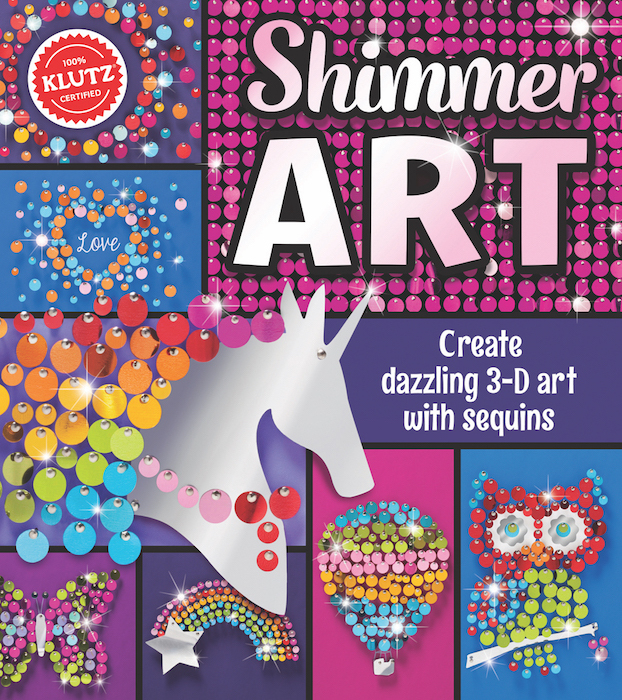 The Shimmer Art kit helps us make 3-D art that shimmers and sways! 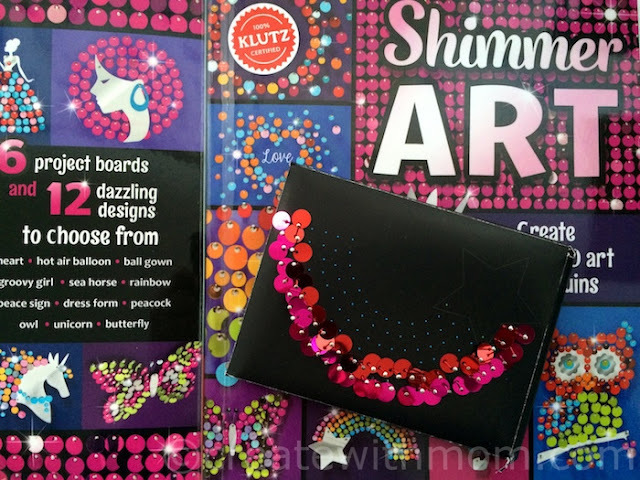 Shimmer Art is similar to String Art, as it uses pins, cardboard, and sequins to add sparkle and shine and craft eye-catching displays to bring a little bling to any space. We can choose from 12 dazzling designs including a unicorn, hot air balloon, sea horse, peacock, and more. The kit includes a Klutz double-tipped tool that helps us easily push pins and sort sequins. Comes with: 48-page book, 12 pattern pages included in book, 800 paillette sequins, 12 specialty sequins, Custom tool 740 straight pins, 6 flat boards, 2 plastic display stands. Color-in Stained Glass kit takes colouring suncatchers to radiant new heights. There are 18 boldly outlined designs printed on translucent paper for us to colour. We can either practice first on the colouring pages before drawing on the vellum, or display two radically different designs. 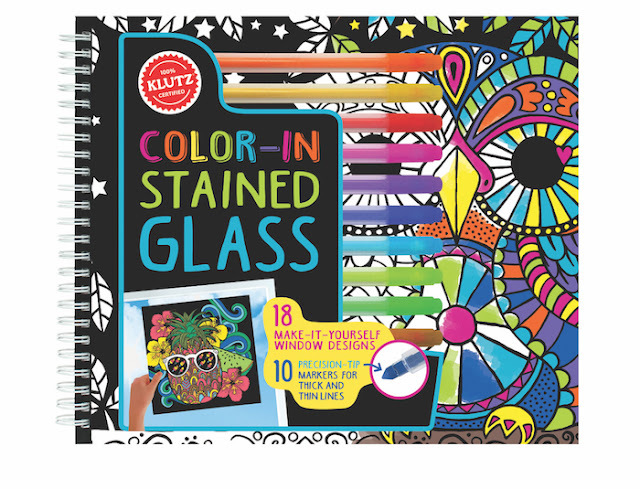 If you are in Canada and would like to win 3 Klutz activity books enter the giveaway through the rafflecopter below before March 13th. Please leave comments and follow my social media links to be eligible to win. Three lucky winners will win a copy of Sew Mini Treats and Color-In Stained Glass, and ONE more book of your choice look at the other titles, and tell in your comments which other book you would love to have. I think my daughter would love this and the glimmer book too! I live in Saskatchewan and the glimmer book. i live in BC. 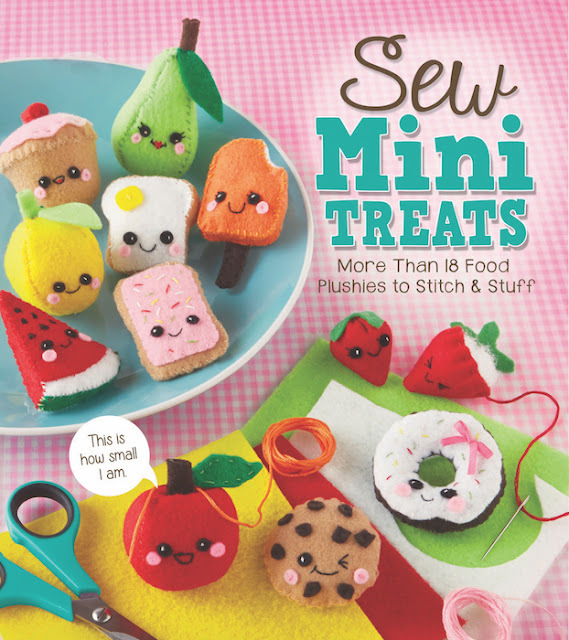 My daughter would love the Sew Mini Treats book. She loves anything Kawaii and these look similar. I love in ON and I'd also like the Mini Pom-Pom Pets: Make your own fuzzy friends! I live in Ontario and the glitter book would be lots of fun . I'm located in ON. Make Glitter Clay Charms would be a great book to have and create with my girl! I love in Ontario, The color in stained glass book looks pretty cool ! I live in Ontario. Shimmer Art would be great! I live in Ontario and my daughter likes the finger knitting book. I live in Saskatchewan and I would choose the My Fashion Portfolio Book. I live in BC and the Glitter Clay Charm book looks great! I live in Ontario and I would choose the smash bot battle as my girls would like the other 2 books. I'm in NB and we'd love to try the Design and Dye book. I am from NL and like to have the finger knitting for my granddaughter. I live in BC and the Boom Splat Kablooey looks amazingly fun! Ontario, the colouring books are nice too. I live in Edmonton. My other choice of book would be "Dress Up Your Own Paper Pups". We live in London Ontario and MiniTreats would be a wonderful book for us. I live in ON and I love some of the coloring books. 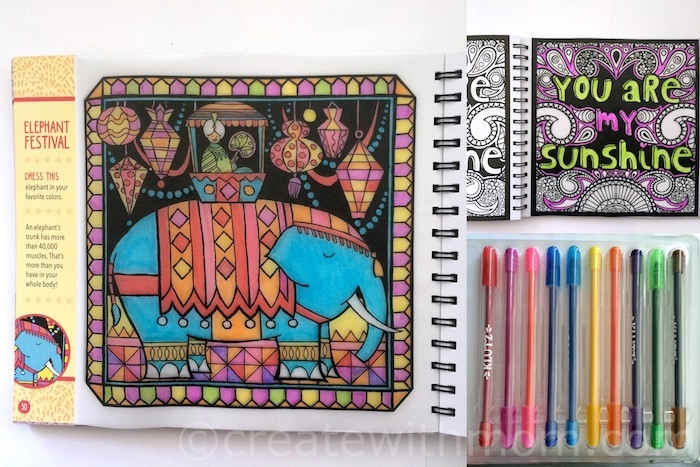 I'm in Alberta and I would like the Coloring Crush book. I live in Lethbridge, Alberta and my son would also enjoy the Boom Splat Kablooey book. Thanks! I live in Ontario. I would love the book on how to Make Glitter Clay Charms. We live int he GTA, the books look fantastic (and adorable!). I would choose the smashbot battle for my son, and the other two for my daughter :) thank you for the opportunity! I live in Nova Scotia and I'd like to get "Drawing for the Artistically Undiscovered." I live in Ontario and would love to get Drawing for the Artistically Undiscovered, my daughter has recently developed a passion for anime and has been spending countless hours drawing at the kitchen table or sitting on her bed. I live in NB and would choose the book on how to make clay charms. I'm in Alberta and I would get Marker Everything. Thanks for the chance! Alberta. I like the Book of Impossible Objects - an interesting study in perception. I live in Ontario and would like the Mini Pom-Pom Pets: Make your own fuzzy friends for my grandson. I live in Ontario and would love Pom Pom Puppies! I live in Alberta and I'd love to have the Color-in Stained Glass. I live in BC. My daughter would love the Design & Dye With No-Heat Batik.